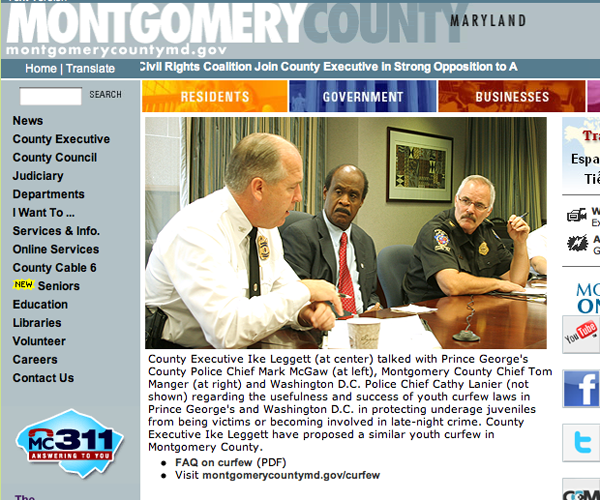 Most Montgomery County Council members say they do not support the youth curfew County Executive Ike Leggett has pushed since July, despite a flash mob robbery at a 7-Eleven in Silver Spring last weekend. Councilmember Berliner has been called a "skeptic" of County Executive Ike Leggett's proposed curfew, which would ban teens under 18 from being out at night. As Council President, he'll set the council's schedule, including votes, and it's likely a curfew vote won't be at the top of his agenda. It's funny: Leggett's office sent out a press release announcing that the Civil Rights Coalition and the American Civil Liberties Union have "joined" him in opposing the anti-loitering bill proposed by Councilmembers Phil Andrews and George Leventhal (full disclosure: my former boss). Of course, both organizations also oppose the curfew, but nobody has to know about that. I'm glad this curfew crap could be over soon. I know curfew supporters had their hearts in the right place, and hopefully we'll get an opportunity to find more productive solutions to the problem (real or perceived) of youth crime. As for the anti-loitering bill: it looks like it's still scheduled for review by the Council's Public Safety Committee next Tuesday, December 1, but it's unclear when a vote will occur. I don't feel much better about it than I do about the curfew, but I hope it'll bring us closer to a conversation about those "productive solutions" I just mentioned.